Chestertown, MD–The 100-Voice Choir and special musical guests will raise their voices and lift spirits in Decker Theatre on the Washington College campus Saturday, November 3, 2012 at 3 p.m. (doors open at 2:30 p.m.) to celebrate the life and example of the late Rev. Vincent Hynson. A 1987 alumnus of Washington College, Rev. Hynson was a dedicated and beloved teacher, coach, pastor and community leader in Kent County who died of cancer in 2004. The gospel concert in his honor will benefit the Vincent Hynson ’87 Scholarship at the College. Special guest artists will include gospel comedian Michael Hynson, The Gospel Sheppards of Kent County, Serenity, and Washington College’s WACappela. Vivian Garnett will serve as emcee. 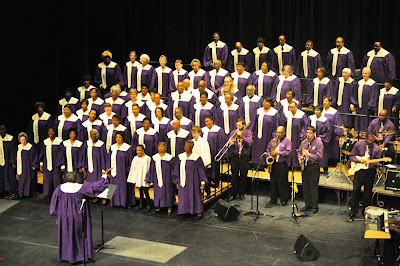 Founded in 2005, the 100-Voice Choir is the vision of Sylvia Frazier, a gospel music producer and promoter who runs S&B Productions with her husband, Bill Frazier. The annual fundraising concert in honor of Vincent Hynson is co-sponsored by Washington College and the Kent County Arts Council and is organized by S & B Productions. Tickets, at $7 a person, will be available at the door. Decker Theatre is located inside the Gibson Center for the Performing Arts on the campus, 300 Washington Avenue. For more information, contact S & B Productions at 410-778-6006 or the Kent County Arts Council at 410-778-1149.